A concept landscape plan and a 3D image of the planned Cobham Drive intersection. Work on the final stretch of Hamilton’s ring road is underway, as part of a $40 million project that will complete an arterial route around the city. Contractors Fulton Hogan started in December on work that is likely to take two and a half years with up to 100 staff on site at its peak. They are tackling the final 400m of Wairere Drive and its intersection with Cobham Drive in stages, starting with gully clearing and building an embankment on the southern side of Cobham Drive. The elaborate intersection will have extensive on and off ramps and the build will include the dramatic raising of a Cobham Drive section to become a bridge while allowing traffic to continue flowing on one of Hamilton’s busiest roads. The grade separated intersection will be one of the busiest in the city. Describing the project as a “jigsaw puzzle”, Fulton Hogan’s project manager Dan Parkes said they will build the two-lane on and off ramps first. “They need to be preloaded so they settle,” he said. “Once we’ve then built pavements on those we can divert the traffic off the main alignment and then come in and physically build the bridge on Cobham Drive. 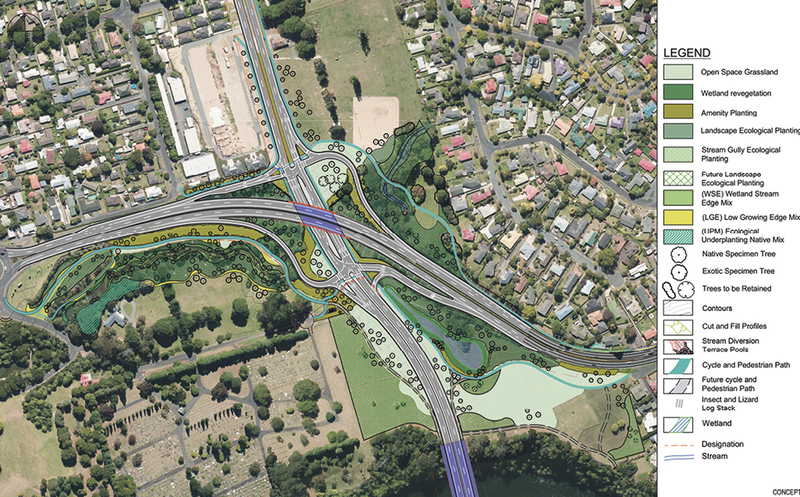 At its highest point, Cobham Drive will be lifted 6m, while the intersection will also allow future access to the Peacocke bridge to be built across Waikato River south of the intersection. Parkes said for most of the project there will be 15 to 20 crew on site, as well as truck deliveries bringing in materials. The 400m stretch of Wairere Drive extension will mostly be built in the next year, but will remain closed until the end of the project to avoid choking Cobham Drive. The estimated total project cost of $38 million includes earlier earthworks done south of the site and the design work by BBO, which is also designing the Peacocke bridge. Hamilton City Council project development manager Chris Barton said the public response to the ring road has been generally supportive, and most are pleased the final stage is now being built, particularly those residents affected by the volume of traffic on Cambridge Road between Wairere Drive and SH1. He said NZTA is making a significant funding contribution, effectively paying for about 75 percent of the total, well above the standard 50 percent subsidy. The plan is to open the new road by mid 2021, with design work on the Peacocke bridge already underway. The Cobham Drive intersection should be finished well before the bridge is ready to open, with substantive work on Peacocke unlikely to start before then.